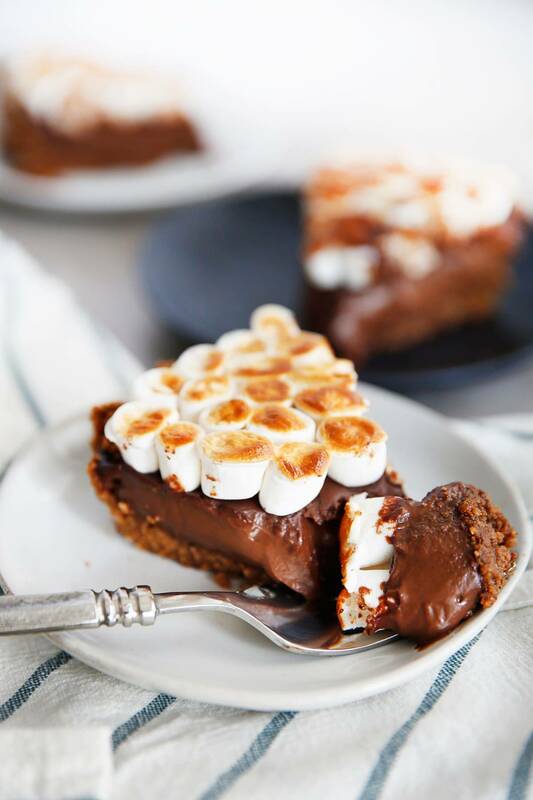 This S’mores Pie is made with a rich chocolate pudding-like filling, made totally gluten-free using my homemade graham crackers or gluten-free graham crackers, and is topped with good quality marshmallows for the ultimate Summer dessert you can feel good about serving! Plus I snuck something healthy into it! Made in partnership with my friends at Vital Proteins! S’mores are the ultimate summer dessert for me. Sitting by the fire pit roasting marshmallows and spending time with family and friends is simply just the best. 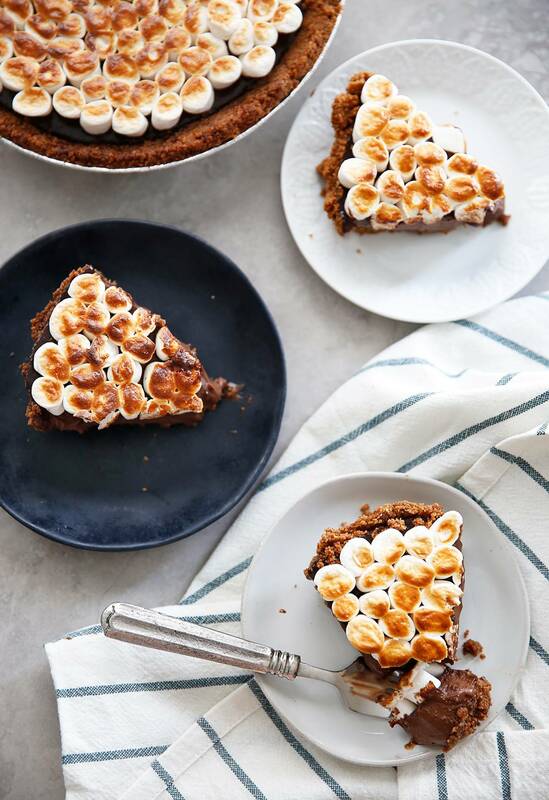 But get this – we’ve taken the classic s’mores you love, and made it into a PIE that you can bring with you anywhere or serve your guests! I have gluten-free/paleo graham crackers in my cookbook that you can make, or you can just buy store-bought gluten-free graham crackers! 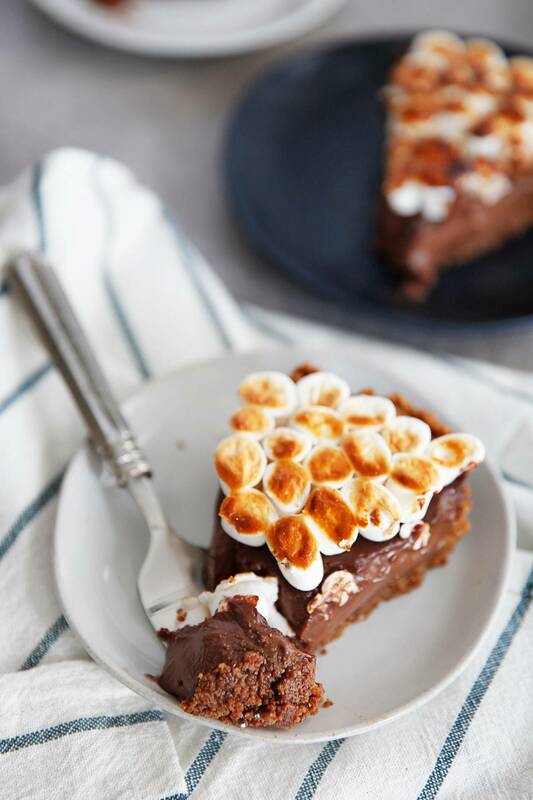 We used cleaner marshmallows and of course, high-quality chocolate, to make this pie not only gluten-free, but one you won’t feel bad about serving! I am so excited to bring you today’s recipe with a little sneaky favorite ingredient of mine! 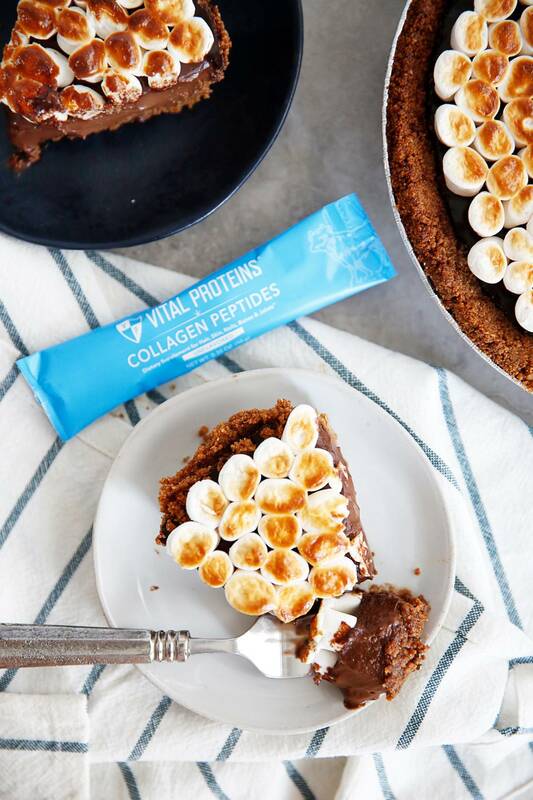 If you read my previous blog post all about how I use collagen peptides in my coffee each morning, you won’t be surprised that I snuck it into this epic S’mores Pie! It dissolves, is totally tasteless and adds extra health benefits for everyone you are serving! It can be added to just about anything and is wonderful for your skin, nails, hair, and for joint and gut health. Want other summer desserts? Try these favorites! Pre-heat oven to 300ºF and position a rack in the center of the oven. Line a baking sheet with parchment paper or a silpat. Prepare graham cracker crumbs in a medium bowl: combine almond flour, flax seed, 1 tablespoon coconut sugar, honey, cinnamon and egg. Place mixture on to prepared baking sheet and using a spatula spread it in an even, thin layer, approximately 1/8 inch thick. Bake for 15-20 minutes, until golden brown, watching carefully to avoid burning. Place on a cooling rack and cool completely, at least 1 hour or longer. Once cool, break up pieces and place in a food processor and process until the crackers are fine. Add remaining 1/4 cup coconut sugar and melted butter and process until combined. Place graham cracker crumbs in a 9" pie plate and carefully press the crumbs up the sides and into the bottom of the plate in an even layer. Place prepared crust on a rimmed baking sheet and bake in the oven for 10 minutes. Once done, if the sides of the crust have slipped down the plate at all, immediately press sides back up the plate and let cool. In a medium sauce pan, heat together coconut milk, sugar, arrowroot and sea salt in a medium saucepan. Bring mixture to a boil over medium heat while whisking constantly. Remove from heat and add chocolate, Vital Proteins collagen peptides, and vanilla. Whisk to combine. Pour the hot chocolate mixture into the prepared pie crust and gently shake to get a smooth top. Top the chilled pie with mini marshmallows in a circle design and place on a rimmed baking sheet. Broil for 1-2 minutes, watching constantly, until marshmallows are light and golden. Serve pie immediately, or keep in refrigerator until ready to serve. Will keep for 1-2 days. Want to take a short cut and use store bought gluten-free graham crackers? Use 7.5 ounces of graham crackers and pulse as directed beginning on step 6. in crust directions and proceed with the remaining of the instructions. For dairy-free, use ghee in place of butter in the crust. What brand of gluten free crackers would you recommend using for this recipe? Thanks! 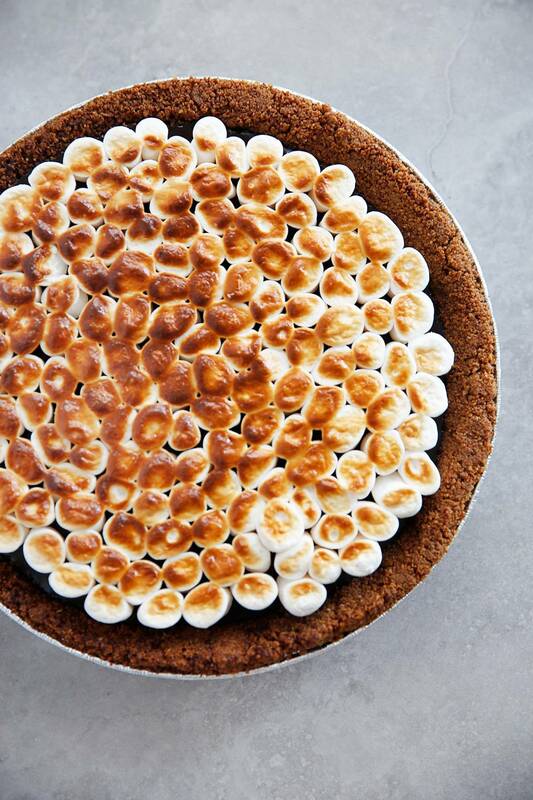 This s’mores pie is literally the best of both worlds! What is the nutritional content? I didn’t see It posted.. Thanks! This is incredible!! So easy and quick to throw together (the marshmallows is the longest part!). The filling is amazing and altogether it’s like Summer in a bite! Definitely a keeper!! Lexi…… could I just mix the crust ingredients and put into the pie pan and prebake vs making the graham crackers and then just pulverizing them in the end? I’m not sure what you mean?! lol 😂 Nevermind, I watched the video.